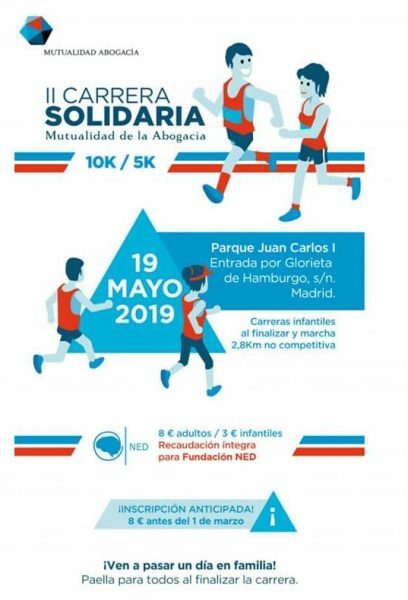 For the second year in a row and after the success of the I Solidarity Race of Mutualidad held in 2018, with more than 1,200 runners, this year we are called for the Second Edition. Solidarity Race of Mutualidad is a family event where you can go, if you wish, with your whole family. In addition to the 5K and 10K races, there will be a solidarity march of 2.8K and children’s races at the end. In addition, they will invite us to paella at the end of the races so that you can regain strength. This year, the amount of the inscriptions will be donated in full to a solidarity cause, with the NED Foundation has being chosen. We are very grateful to Mutualidad de la Abogacía for this enormous gesture towards us.